The British Film Institute has uploaded a 30 minute video from the premiere of An Adventure in Space and Time onto its website. 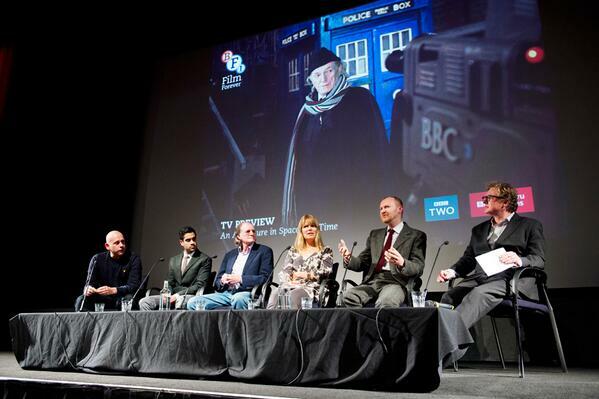 Journalist Matthew Sweet leads a discussion on a new BBC drama revealing the story behind Doctor Who’s genesis. Jessica Carney – granddaughter and biographer of original Who actor William Hartnell – joins writer Mark Gatiss and actors David Bradley and Sacha Dhawan to talk about one of television history’s defining moments. David Bradley chats about playing William Hartnell in Doctor Who docudrama An Adventure in Space and Time and the responsibility to honour William Hartnell’s memory. In the interview David Bradley also reveals what he thinks about Peter Capaldi taking over from Matt Smith as the new Doctor in the Doctor Who 50th Anniversary year at the 2013 Collectormania comic con. The BBC has uploaded an exclusive clip from the Doctor Who genesis docudrama, An Adventure in Space and Time, onto YouTube. The Australian trailer for An Adventure in Space and Time currently being broadcast on ABC1. The 90 minute docudrama will be aired on Sunday 24 November 2013 at 8.50 p.m. following the encore screening of The Day of the Doctor.